[Guest Post] ATTENTION: Wanna go on an adventure? This is a first... a GUEST POST! I'm so excited! A few weeks ago my little office became quite the lonely little office. You see most days I have regular interruptions throughout the day that keep me relatively sane. So, when my 2nd floor, cube-land bestie left for a little adventure for two weeks, I didn't know what I was going to do!! Cue the dramatic music. There were no morning disruptions, no lunch time distractions, and no one to make popcorn...major tragedy. It was devastating! But alas, I survived and so did she (it was touch and go there for a minute), and when she got back I begged her to do a guest post for you all to hear about her wonderful trip! Thanks Amy for agreeing to do this! I'm so glad you got to cross this off your list and more importantly, I'm glad you're back to make me popcorn! "Last month I had the opportunity to travel to Thailand with my brother. Now most people ask why Thailand? For that answer you have to take a journey with me back 3 years ago when I studied abroad in Australia. I had the greatest time being half way around the world and really learning what it was like to be on my own. I was able to learn about myself and gained the confidence to travel alone. From that point on, I knew travel was going to be a big part of my life. I am not a person who has this big “bucket list” of things that I want to accomplish in my life but after that trip I knew I wanted to travel to all 7 continents (yes even Antarctica) by the time I was 30. Fast forward 4 years and 3 trips later, Thailand became my 6th continent that I have been to! When leaving for Thailand, there was news that the military had taken control over Thailand. That made me a little nervous but with Molly’s amazing knowledge of international studies (yes that college degree has paid off in my mind), it was decided I did not have much to worry about just needed to be cautious of where I was going. First stop was Bangkok. I spent 4 days in Bangkok, which sadly to say is very much like a big city anywhere else in the world but has beautiful temples. 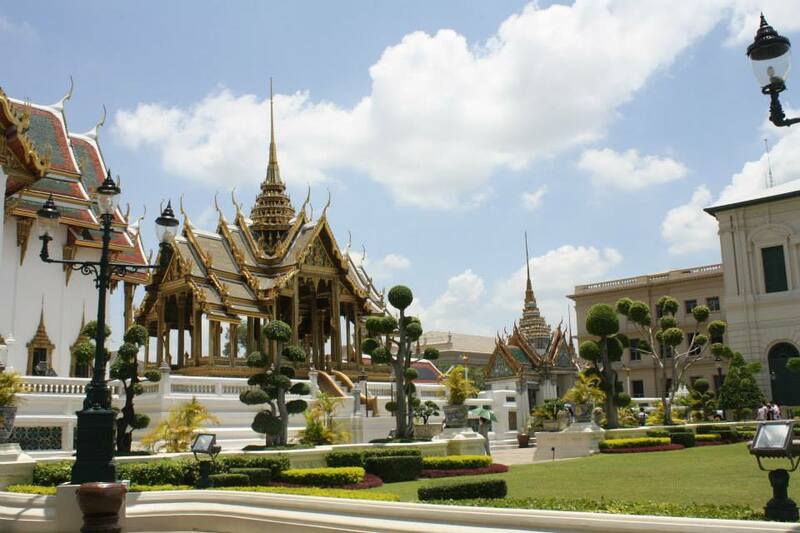 We spend the first day going to the Grande Palace and the reclining Buddha. Now growing up in a Christian home and going to school in the south, I honestly do not know much about Buddhism but everything from the paintings on the walls to the decorative chairs were amazingly detailed. There were so many details about everything that I was absolutely in awe. The other days in Bangkok we went on a food tour, to more temples and to one of the biggest open air markets in Asia. I already LOVE Thai food so actually being in Thailand and it being perfectly acceptable to have fried rice for breakfast, I felt like I was in heaven. Props to America for the Thai food here being pretty similar to the traditional Thai food. The only difference is the heat level. I, for one, am not the biggest fan of spicy foods but while in Thailand why not do what the Thai’s do. Good thing there was rice served with everything or else I think my mouth would have literally been on fire. While in Bangkok, we took a side trip about 3 hours west, almost to the Burma border. It was amazing how a 3 hour drive made a huge difference in the scenery. There were mountains and forests and nothing like a city at all. That day we rode elephants, and not just your typical chair looking thing on top of the elephant. I rode bare back on the elephant! Now for a girl who doesn’t particularly like horses, this was more than I had bargained for. It was absolutely amazing though! We walked around for a good half an hour then went into the water with the elephants. Next stop on our adventure was Koh Phi Phi, an island in the Andaman Sea. The thing that got me most excited for going to the islands was that I was going to get to relax. While there we stayed at a really great resort and was finally able to relax. I was able to get a little bit of adventures in there including snorkeling and rock climbing. It was so great to have the goal of 2 of my days to be not get burned. It was truly great to really have nothing to do. With the busy lives we all live, I can say I have nothing to do over the weekend but there is always something that can be done, from laundry to coffee with a friend there is never a weekend when I actually do nothing. I still cannot believe that just 2 weeks ago I was in Thailand half way around the world and now I am back in the office going about my daily routine of being in the “real world.” I cannot help but already start to plan what my next adventure will be!"